Saffron is described as ‘bringing out a wealth of flavours’ or as ‘lifting and enhancing the flavours’ of all things in a dish’ and a spice where a little goes a long way to enhance both flavour and colour. It takes up to 150,000 flowers to produce a kilo of the spice? 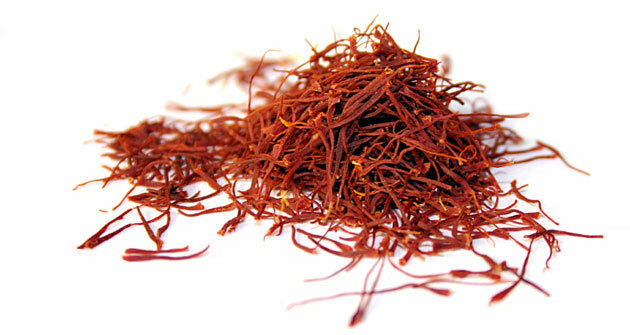 Saffron is the gold of cuisine, in fact it’s more expensive than gold. The question is, does the investment of saffron, meet the culinary satisfaction? Those of us who have cooked with it would most certainly say yes. This exotic and expensive spice is both captivating and intriguing and we would like to teach you how to grow your own. Last year was the first year we were able to offer saffron bulbs, and they were a hit! This year we have managed to source bigger corms. The flowers appear in early autumn, and are handpicked in the morning, ideally before the flowers open. They must be plucked and dried on a dehydrating tray the day they bloom. If planting in bulk plant in beds 50cm wide with paths of 50cm. A path ensures easier harvest; this path can be mulched with sawdust if desired, this also helps to distinguish where you have planted the saffron which is not always visible. Dig beds to a depth of 15-20cm and incorporate Oderings Compost into the soil. Fertilise beds after planting the bulbs and again in January/February. You can use Tui Bulb fertiliser, but if you want to get more specific use this magic combination. Rock phosphate 2 parts for root growth, Dolomite 1 part for source of magnesium, Lime 1 part to raise the pH of the soil (saffron likes a neutral soil), Gypsum 1 part as a clay breaker and soil conditioner with a source of potassium as ¼ part for enhanced flower production. Please note, although some nitrogen is necessary for plant health and growth any excess will contribute to leaf production at the expense of flower production. Corms are planted 10cm deep, 10cm apart. Water in with a liquid fertiliser containing seaweed and fish emulsion and trichoderma. A new product called ‘Fish & Seaweed Growth Booster’ by Egmont’s Commercial has all three of these ingredients and is 100% natural. This product is an essential part of your saffron maintenance. Trichoderma is specially formulated to act as a living barrier against damping off and root rots, while boosting the resilience and strength of the plants own immune system. Flowers and leaves can appear from the last week of March to first week of May over a four week period. The start and end of flowering will vary slightly every year, which is brought on by the first rains towards the end of March. Generally, however, the harvesting season is through April. Flowers need to be picked every morning as early as possible. Flowers not picked on the day of flowering will usually have deteriorated to a point of non-usability by the 2nd morning after flowering. Flowers that are proud off the ground and showing a part of stem can be picked. Use your thumb and first finger and slightly twist, or can nip with finger nails. Leave flowers that have not completely emerged for an hour or two before picking later in the day. Pick the flowers and place them in dry sanitised buckets with a paper towel at the bottom to absorb moisture and keep the flowers dry. Flowers will keep in the fridge or chiller once picked for up to three days. Each corm can produce up to 6 flowers over the flowering period. The amount of flowers increases each season for a number of years, and then decreases as the corms get overcrowded and compete for nutrition. These corms should be dug up every three to four years and re-planted. Once picking is complete for the day, process flowers by removing the stigma (which is the part of the flower traded commercially). Flowers are placed on a flat covered surface. The flower has three parts; the petals which are purple, the stamen which is yellow and the stigma which is orange to maroon (and has three prongs). The stigmas are removed a variety of ways. Generally its easiest to hold the stigma with the fingers of your left hand and pinch the bottom of the flower with the finger nails of your right hand, (and the flower falls to pieces) leaving the stigma in the left hand which is then placed on a the drying tray in a straight position. Stigmas are dried for 2 hours at 65c in a dehydrator. Remove from the dehydrator and store in an airtight container. 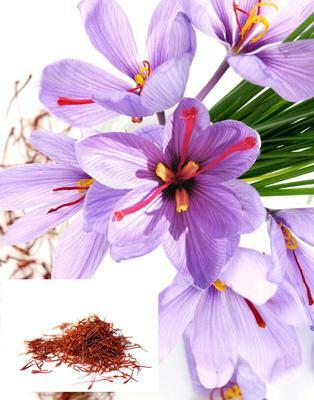 When the flowering season is complete the saffron plants will now only have leaves which look like a type of grass. It is important to keep up fertilisation during autumn and winter to build your flowers for next year and to increase the amount of corms. During the growing season and after flowering use ‘Fish & Seaweed Growth Booster’ every two weeks. Stop fertilising in October as the plants go dormant in anticipation for the summer.